The antimicrobial activities and preservative potentials of crude extracts of Alstonia boonei stem bark and Euphorbia hirta leaves were studied in minced meat. Soxhlet extraction and cold ethanol extraction methods were used for the extraction of the dried and ground samples. A well-in-agar diffusion method was used for antimicrobial screening at different concentrations on Escherichia. coli, Bacillus. subtilis, Staphylococcus. aureus, Salmonella. typhi and Saccharomyces. cerevisiae. The preservative effects at 0.1, 0.2 and 0.3% alone and in combination were determined in minced meat using E. coli and B. subtilis as test isolates. E. hirta cold and A. boonei cold extracts gave the highest zone of growth inhibition of E. coli and B. subtilis with 20 mm zone diameter at 200 mg/mL concentration. Phytochemical analysis revealed the presence of alkaloids, flavonoids, tannins, saponins and cardiac glycosides. A. boonei at 0.1, 0.2 and 0.3% produced a log cycle reduction on the growth of E. coli while the mixture of A. boonei and E. hirta extracts (1:1) at 0.1% and 0.2% produced a log cycle reduction of the growth of E. coli and B. subtilis in minced meat at the end of storage. However, the A. boonei extracts had more significant effect on the isolates. The results revealed the potentials of the plant extracts as natural antimicrobial preservatives in meat. The observed antimicrobial activities may be attributed to the phytochemicals identified in the extracts. Food preservatives are natural or synthetic substances which are added to foods to retard spoilage, whether from microbial growth or undesirable chemical changes (Tiwari et al. 2009). Some chemical preservatives such as benzoates, nitrites and sorbates have been used by manufacturers to prolong the shelf life of foods. However, they have not been considered as a comprehensive control method (Xing et al. 2010). The increasing occurrence of foodborne diseases, epidemics and growing interest in consumer demand for safe, fresh, ready to eat high quality foods raise considerable challenges, especially with the increase in drug resistance by microorganisms and health challenges associated with the use of chemical / synthetic preservatives (Chana-Thaworn et al. 2011, Tajkanmi et al. 2010). The demand for safe foods, coupled with the preference by consumers for foods free of synthetic additives, has increased the interest for natural preservatives in recent years (Potterton et al., 1996). Great emphasis has recently been focused on the utilization of plant extracts for antimicrobial preservation of foods. A vast number of plants have been recognized as valuable resources of natural antimicrobial compounds which include a vast diversity of phytochemicals such as alkaloids, phenolics, flavonoids, tannins, lignin and other small compounds which have been found to possess antimicrobial properties (Cowan, 1999; Mahady, 2005). A wide range of these phytochemicals are known to inhibit bacterial pathogens (Cowan, 1999; Medina et al., 2005; Romero et al., 2005). These compounds possess numerous heath related effects such as antibacterial, antimutagenic, anticarcinogenic, antithrombotic and vasodilatory activities and can exert synergistic effects with antibiotics (Bidlack et al., 2000; Wang et al., 2016). The numerous harmful effects associated with chemical preservatives which include heart damage, breathing difficulties, cancer, liver damage, birth defects, diarrhea and allergies have made consumers unwilling to accept food products whose shelf life and keeping qualities are enhanced by chemical preservatives. Thus this research work aims at determining the antimicrobial activities and preservative potentials of Alstonia boonei stem bark and Euphorbia hirta leaves (which are commonly used medicinal plants in Nigeria) in minced meat,. Alstonia boonei De Wild (A. boonei) is a medicinal plant of West African origin, popularly known as Egbu in Igbo language. A. boonei De Wild belongs to the family Apocynaceae and the species are scattered all over the world of which two are indigenous to Africa. In some African countries, A. boonei is considered a sacred tree and worshiped in the forest (Adotey et al., 2012). The bark of this tree has been found to possess anti-rheumatic, anti-inflammatory, analgesic/pain-killing, anti-malaria/antipyretic, antidiabetic (mild hypoglycaemic), anti-helminthic and antimicrobial properties (Adotey et al., 2012; Fakae et al., 2000; Hadi and Bremner, 2001). Parts of the plant have been found to be rich in various bioactive compounds which include echitamidine, Nα-formylechitamidine, boonein, loganin, lupeol, ursolic acid, and β-amyrin among in which the alkaloids and triterpenoids form a major portion (Adotey et al., 2012; Wang et al., 2016). Euphorbia hirta L. belongs to the family Euphorbiaceae. It is a small annual herb common to tropical countries. All species of Euphorbia exudes a milky juice when broken (Williamson, 2002). Euphorbia hirta is used in traditional medicine in the treatment of gastro intestinal disorders (diarrhea, dysentery, intestinal parasitosis), respiratory and bronchial diseases (asthma, bronchitis, hayfever) and in conjunctivitis. Hypotensive and tonic properties are also reported in E. hirta. The aqueous extract exhibits anxiolytic, analgesic, antipyretic and anti inflammatory activities. The stem sap is used in the treatment of eyelid styles and a leaf poultice is used on swelling and boils (Prajapati et al., 2003). Fresh leaves of Euphorbia hirta and stem bark of Alstonia boonei were collected between March and May, 2014 from Umuguma and Obinze, Owerri West Local Government Area of Imo State, Nigeria. The taxonomy of the plants was authenticated by I Ibeawuch, of the Department of Crop Science Technology, Federal University of Technology, Owerri. The leaves and stem bark were cleaned to remove sand and other extraneous materials. Two extraction techniques were adopted for the extraction of plant bioactives; the cold ethanol and hot ethanol (soxhlet) extraction techniques. For the cold ethanol extraction method, the fresh leaves and stem bark were air dried for about four weeks and separately ground into fine powder under aseptic conditions using a mechanical grinder. Twenty (20) g of the fine powder were weighed into 250 ml of ethanol (95%). These were covered, shaken every 30 min for 6 h and then allowed to stand about 48 h. The solutions were subsequently shaken and filtered using Whatman filter paper No 1. The filtrates were evaporated to dryness using a rotary evaporator (Model type 349/2, Corning Inc. USA) and stored at 4oC until required for antimicrobial assay. The hot ethanol extraction technique was carried out as follows: 20g of each of the ground plant samples were collected and wrapped in filter papers, each weighing 2 g. These were put in the timble of a soxhlet apparatus and 250 ml of ethanol (99%) was put in the round bottom flask and heated until seven refluxes (Obi and Onuoha, 2000). Evaporation to dryness using a rotary evaporator (Model type 349/2, Corning Inc. USA) was performed and the extract was stored at 4OC until required. The methods of Selvamohan et al. (2012) and Amole and Ilori (2010) were adopted with some modifications. The crude extracts were dissolved in 5% dimethylsulphoxide solution (DMSO) and further diluted to obtain 200, 100, 50 and 25 mg/ml concentrations. These were stored at 50C until required. The organisms Escherichia coli, Staphylococcus aureus and Salmonella typhi which are common pathogens transmitted through food were isolated from clinical samples obtained from patients at the Federal Medical Centre, Owerri while Saccharomyces cerevisiae were isolated from fruits and Bacillus subtilis from fermented African Oilbean seeds. These are common spoilage organisms. They were re-isolated, identified using standard methods and the pure cultures subcultured on Nutrient agar slants (CM0 003, Oxoid) for bacteria and Potato Dextrose agar (CM0 139, Oxoid) for yeasts. They were stored at 40C until required for the study. The well in agar diffusion method as described by Amole and Ilori (2010) was adopted for the study. Molten Nutrient agar (CM0 003, Oxoid, 15 mL) and Potato Dextrose agar (CM0 139, Oxoid) were seeded with 0.1 ml of standardized broth cultures of bacteria and yeasts respectively (approximately 1.0 x 105 cfu/ml) by introducing the broth cultures into sterile Petri dishes, incorporating the molten agar, rotating slowly to ensure uniform distribution of the microorganisms and then allowed to solidify on a flat surface. Three holes were made in the plates (about 5.0 mm diameter) using a sterile cork borer and equal volumes of the extracts (0.05ml) were transferred into the holes using a Pasteur’s pipette. Two Petri dishes containing a particular microorganism were used for each concentration of the extracts. The plates were allowed to stand for 2 h for pre-diffusion of the extract to occur (Ogbulie et al., 2007) and were incubated at 370C for 24 h for bacteria, and 30oC for 72 h for yeasts. All experiments were carried out in triplicate. At the end of incubation the plates were collected and zones of growth inhibition that developed were measured in triplicate. The average of the zones of inhibition was calculated. The isolates used for the determination of the preservative potentials were those that were reasonably inhibited by the extracts as shown in the antimicrobial assay (E. coli and B. subtilis). The procedure described by Careaga et al (2003) was used with slight modification. Post rigor lean fresh beef muscles were obtained from a slaughter house in Obinze, Owerri, Imo State, Nigeria and each piece was immersed in boiling water for 5 minutes to surface sterilize the beef. The cooked surface of the beef muscle was eliminated with sterile knife under aseptic conditions. The pieces of meat prepared as above were minced in a sterile grinder, and portions of 100g were put in closed sterile containers. Half of the minced meat in the containers was inoculated with 0.1ml of 106 cfu/ml of E coli while the other half was inoculated with 0.1ml of 106 cfu/ml of B. subtilis. Prior to the inoculation of the meat, the different samples of the meat in the containers were added different concentrations of the crude plant extracts (A. boonei and E. hirta) at 0.1, 0.2 and 0.3%. The samples were mixed thoroughly to ensure even distribution of extracts. Some minced meat samples were also inoculated with 0.1, 0.2 and 0.3% of the mixture of the extracts (1:1 ratio). The containers containing the meat samples were stored aseptically for 18 days at ambient temperature (30OC – 32OC) and monitored initially at 48 hour interval for 7 days and later 96 hour interval for the rest of the storage period to determine the number of the surviving bacteria by plating out samples on appropriate agar media. Agar plates without extracts but inoculated with test isolates served as control. The colony forming units (cfu) per gramme of sample was calculated at the end of incubation. The preliminary test for the presence of alkaloids, flavonoids, saponins, tannins and cyanogenic glycosides were carried out according to the methods described by Trease and Evans (1989). The data obtained from the study was fitted into two way experimental design; Extracts (5) x Concentration (4), and subjected to statistical analysis using Analysis of Variance (ANOVA) and the means were separated using Fisher’s Least Significant Difference (LSD). Microsoft Excel 2007 was used for data processing. The results of the preliminary phytochemical analysis of the crude plant extracts are summarised in Table 1. Alkaloids, tannins, saponins, flavonoids and cyanogenic glycosides were present in all the plant extracts. It was observed that the quantity of phytochemicals extracted by the hot extraction method was generally higher than the cold extraction method except for alkaloids in E. hirta and saponins in A. boonei. The higher yields obtained with the hot extraction method could be due to the elevated extraction temperature, effecting pressure on the cell membrane structures thereby enhancing interaction with the matrix resulting in the higher and faster diffusion of the bioactive compounds from the plant materials into the solvent (Hayouni et al., 2007; Spigno and De, 2009). Several authors have also identified these compounds in the plant extracts they used for their studies (Akinmoladun et al., 2007; Ogbulie et al., 2007; Ogbuneke, 2001). The results of the antibacterial screening of the different concentrations of the crude plant extracts are shown in Tables 2, 3, 4, 5 and 6. The results showed that increase in concentration of the extracts increased the zone of growth inhibition of the microorganisms. The highest zone of growth inhibition was exhibited by E.hirta and A. boonei cold extracts on E. coli and B. substilis respectively with 20 mm zone diameter at 200mg/ml concentrations. This was followed by A.boonei hot with a zone diameter of 18 mm on S. aureus, and E.hirta hot and cold extracts producing a zone diameter of 16 mm on S. aureus and B. subtilis respectively at 200mg/ml concentrations. The 25 and 50 mg/ml concentrations had little or no inhibition on all the test microorganisms. 100mg/ml concentration gave slight inhibition zones. The lowest zone of growth inhibition at highest concentration of 200mg/ml of all the extracts was observed on S. cerevisiae (7 mm). Results obtained from this study indicate that all the crude plant extracts inhibited the growth of the bacterial isolates to varying degrees. These results indicate that the plants possess bioactive compounds that can inhibit the growth of some microorganisms. The findings are in agreement with the findings of Abdulahi and Suleiman (1998), Esimone et al. (1998), Ntiejumokwu and Kolawole (1991), Nweze et al. (2004), Okoli and Iroegbu (2004), Osadebe and Ukwueze (2004) and Sudhakar et al. (2006). They found that various extracts of plants inhibited the growth of some hospital bacterial isolates. The observed antimicrobial properties of the extracts could be due to the presence of alkaloids, flavonoids and tannins either alone or in combination, which were identified in the extracts. These groups of compounds have been identified to possess antimicrobial properties (Cowan, 1991; Draughon, 2004; Kapoor et al., 2015). Other authors have also attributed the observed antibacterial effects of their plant extracts to the presence of these groups of compounds which they also identified in the plant extracts used for their study (Adesokan et al., 2007; Fasolo and Egunyomi, 2005; Nile and Park, 2014; Ntiejumokwu and Kolawole, 1991; Nweze et al., 2004; Ogbulie et al., 2007; Osadebe and Ukweze, 2004; Sahm and Washington, 1990). The values obtained when the extracts were used alone or in combination on the microorganisms were significantly different (p<0.05). The lower zones of growth inhibition recorded for some of the isolates may be because these organisms possess mechanism (s) for detoxifying or removing the bioactive compounds of the plant extracts. Some researchers have shown that some microorganisms can detoxify certain compounds that are toxic to them (Braude, 1982; Ogueke et al., 2014). The low values recorded for some plant extracts may also be attributed to the extracts being in crude form or could be due to compounding factors such as age of the plant and season the study was carried out. However, it may be possible to obtain better results if the extracts are further purified to remove other components that do not possess antibacterial properties or interfere with the activities of the active compounds. Okoli and Iroegbu (2004) in their evaluation of the ethanolic extracts of Anthocleista djalonensis, Nauclea latifolia and Uvaria afzalii for activity against bacterial isolates from cases of non-gonococcal urethritis found that partial purification of their extracts broadened the spectrum of activity and generally improved the potency of Uvaria afzalii. Such plant extracts can also exert synergistic effects on bacteria with antibiotics (Wang et al., 2016). Several authors have, however, reported bioactivity of crude extracts of medicinal plants with such range of diameter zone of inhibition (Akinyemi et al., 2006; Ogbeche et al., 1997; Olukoya et al., 1993). 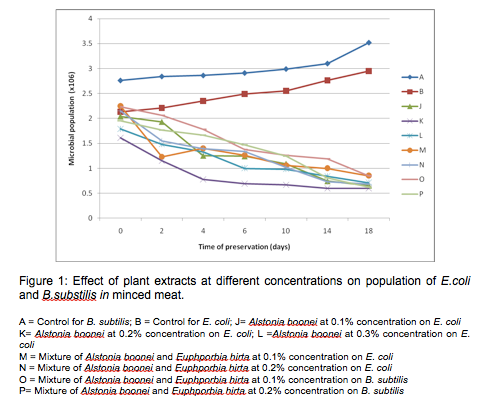 Figure 1 shows the graph of the effects of crude plant extracts (A.boonei and E.hirta) at different concentrations on the population of E.coli and B.subtilis in minced meat. A.boonei cold extract at 0.1%, 0.2% and 0.3% reduced the growth of E. coli by one log cycle at the end of storage (for example A. boonei at 0.1% reduced E. coli from 2.04 x 106 to 6.5 x 105). It was also observed that the mixture of A. boonei and E. hirta extracts (1:1) at 0.1% and 0.2% produced a log cycle reduction in the number of E. coli and B. subtilis, however, the reduction was more significant (p<0.05) with A. boonei at 0.1% and mixture of A. boonei and E. hirta extracts at 0.2% on E. coli. The mixture of extracts at 0.1% concentration recorded a sharp decrease in the number of E. coli within two (2) days of storage. These results are of great significance in food preservation. E. coli is responsible for a number of food related illnesses that manifest themselves in the form of diarrhoea while B. subtilis is a common spoilage bacterium (Adams and Moss, 1999). The inhibition of microbial growth on the beef samples during storage can be attributed to the changes in the meat environment caused by the plant extracts. Thus the inhibition of these microorganisms can also be attributed to the fact that these plant extracts contain various phytochemicals which have been known to have inhibitory effects on microbial growth (Rodriquez-vaquero et al., 2007). From other research works reported on the preservation of food using essential oils from oregano and thyme, results have shown that their essential oils inhibited the growth of Salmonella spp up to a significant level (Bajpai et al., 2012; Hayouni et al., 2008; Soew et al., 2014). Selim (2011) also studied the preservative properties of essential oils of some plants on vancomycin resistant Enterococci and E. coli. The essential oils produced one log cycle reduction on the number of the bacteria after three days of storage. In this study a log cycle reduction was obtained after 18 days of storage. It may be that further purification would improve the antibacterial/biopreservative effects on the organisms as has been shown by some workers (Okoli and Iroegbu, 2004). However, the major problem with meat products is their high fat content which is responsible for the weak action of essential oils and extracts of plants on these products (Mejiholm and Dalgaard, 2000). It is generally accepted that high levels of fat in foods protect bacteria from the action of the extracts. The oils in the plant extracts would be dissolved in the lipid phase of the food and would be less available to act on bacteria that are present in the aqueous phase (Moreira et al., 2005). It may be that this contributed to the lower level of inhibition observed with the extracts in the minced meat. The diffusion rate of these crude plant extracts’ active principles can also limit the effects of their action on the microorganisms (Ponce et al., 2004). During the preservation process, two factors are important, firstly the contact time for the extracts to exert their effects and secondly the concentration required to achieve a degree of inhibition. It may be that the concentrations of extracts applied were too low to inactivate the bacterial isolates. The presence of flavonoids in the extracts shows that the plant extracts have potent antioxidant activity. Their ability to scavenge hydroxyl radicals, superoxide anions and lipid peroxy radicals could be the most important function of flavonoids (Iniaghe et al., 2009). This property could be harnessed in the food industry for preservation of foods especially now that functional foods are being emphasized and popularized. Tannins are also known antimicrobial agents; they have been reported to prevent the growth and development of microorganisms by precipitating microbial proteins and making nutritional proteins unavailable for them to use (Prasad et al., 2008). Thus investigations should still be carried out to identify conditions that will maximize the effects of these crude plant extracts in food products. This study has shown that the studied extracts of the plants possess antimicrobial activities against the test isolates. However, the cold extracts exhibited greater antimicrobial activity on the isolates. The studied extracts therefore have great potential as antimicrobial compounds that could be applied to foods as bio-preservative agents. Further work aimed at isolation, purification and characterization of the active compounds should be initiated thus leading to development of new antimicrobials that could be applied in food preservation to replace synthetic preservatives. Further studies are also required to determine the mechanism(s) of action of the active compounds as well as their toxicological effects on humans. Abdullahi, M., Suleiman, M.A.T., 1998. Cytotoxic and antimicrobial activities of the stem bark extract of Sclerocarya birrea. J. Chem. Soc. Nigeria. 23: 16– 18. Adams, M.R., Moss, M.O., 1999. Food Microbiology. The Royal Society of Chemistry, Cambridge, pp181-186, 192-203. Adesokan, A.A., Akanji, M.A., Yakubu, M.T., 2007. Antibacterial potentials of aqueous extract of Enantia chlorantha stem bark. Afr. J. Biotechnol.. 6(22): 2502 - 2505. Adotey, J.P.K., Adukpo, G.E., Boahen, Y.O., Armah, F.A., 2012. A review of the ethnobotany and pharmacological importance of Alstonia boonei De Wild (Apocynaceae). ISRN Pharmacol 2012: 587160. Akinmoladun, A.C., Ibukun, E.O., Afor, E., Alinrinlola, T.R., Onibon, A.O., Akinboboye, A.O., Obuotor, E.M., Faromdi, E.O., 2007. Chemical constituents and antioxidant activity of Alstonia boonei. Afr.J. Biotechnol.. 6(10): 1197 – 1201. Akinyemi, K.O., Oluwa, O.K., Omomigbelin, E.O., 2006. Antimicrobial activity of crude extracts of three medicinal plants used in South west Nigerian folk medicine on some food borne bacterial pathogens. Afr.J. Trad. Complemen. Alt. Med. 3 (4): 13 - 22. Amole, O.O., Ilori, O.O., 2010. Antimicrobial activity of the aqueous and ethanolic extracts of the stem bark of Alstonia boonei. Int. J. Phytopharmacol.. 1(2): 119 -123. Bajpai, V.K., Baek, K.H., Kang, S.C., 2012. Control of Salmonella in foods using essential oils: A review. Food Res. Internat.. 45(77): 722 - 734. Bidlack, W.R., Omaye, S.T., Meskin, M.S., Topharm, D.K.W., (2000). Phytochemicals as bioactive agents. CRC Press, Boca Raton. FL. Braude, A.I. 1982. Microbiology. W. B. Saunders Company, London. Careaga, M., Fernandez, E., Dorantes, M.K., Jaramillo, M.E., Hernandez Sanchez, H., 2005. Antibacterial activity of capsicum extract against Salmonella typhimunum and Pseudomonas aeruginosa inoculated in raw beef meat. International Journal of Food Microbiology. 83: 331 - 335. Chana-Thaworm, J., Chanthacum, S., Wittaya, T., 2011. Properties and anti- microbial activity of edible films incorporated with kiam wood (cotyleobium ianceotatum) extract. Food Science and Technology. 44(1): 284 - 292. Cowan, M.M., 1999. Plant products as antimicrobial agents. Clinical Microbioloqgy Review. 12: 564 - 584. Draughon, A. 2004. Use of botanicals as biopreservatives in foods. Food Technology. 58 (2): 20 - 28. Esimone, C.O., Adikwu, M.U., Okonta, J.M., 1998. Preliminary antimicrobial screening of the Ethanolic extracts from the lichen usnea subfloridans (L). Journal of Pharmaceutical Research and Development. 3(2): 99- 101. Fakae, B.B., Campbell, A.M., Barrett, J., Scott, I.M., Teesdale-Spittle, P.H., Liebau, E. et al., 2000. Inhibition of glutathione S-transferases (GSTs) from parasitic nematodes by extracts from traditional Nigerian medicinal plants. Phytother Res. 14(8): 630-634. Fasola, T.R., Egunyomi, A., 2005. Nigerian usage of barks in phytomedicine. Ethnobotany Research and Application. 3: 73 - 77. Hadi, S., Bremner, J.B., 2001. Initial studies on alkaloids from Lombok medicinal plants. Molecules 6(2): 117-129. Hayouni, E.A., Abedrabba, M., Bouix, M., Hamdi, M., 2007. The effects of solvents and extraction method on the phenolic contents and biological activities in vitro of Tunisian Quercus coccifera L and Juniperus phoenica L. fruit extracts. Food Chemistry. 105: 1126 - 1134. Hayouni, E.A., Chraief, I., Abedrabba, M., Boux, M., Leveau, J.Y., Mohamed, H., Hamdi, M., 2008. Tunisian Salvia officinalis L and Schinus molle L. essential oils. Their chemical composition and their preservative effects against salmonella inoculated in minced beef meat. International Journal of Food Microbiology. 125: 224 - 251. Iniaghe, O.M., Malomo, S.O., Adebayo, J.O., 2009. Proximate composition and phytochemical constituents of leaves of some Acalypha species. Pakistan Journal of Nutrition. 8: 256-258. Kapoor, A., Gurdeep, K., Rajinder, K., 2015. Antimicrobial activity of different herbal plant extracts: A Review. World Journal of Pharmacy and Pharmaceutical Sciences. 4 (7): 422 – 459. Mahady, G.B., 2005. Medicinal plants for the prevention and treatment of bacterial infection. Curr. Pharm Des. 11: 2405-2427. Medina, A.L., Lucero, M.E., Holgum, F.O., Estell, R.E., Posakony, J.F., Simon, J., Connel, O.M., 2005. Composition and antimicrobial activity of Anemopsis californica leaf oil. Journal of Agriculture and Food Chemistry. 53: 8694 - 8698. Mejlholm, O., Dalgaard, P., 2002. Antimicrobial effects of essential oils on the sea food spoilage microorganism Photobacterium phosphoreum in liquid media and the fish products. Letters of Applied Microbiology. 34: 27 - 31. Moreira, M., Ponce, A., Del valle, C., Roura, S., 2005. Inhibitory parameters of essential oils to reduce a foodborne pathogen. Lebensm wiss. Technology. 38 (5): 565 - 570. Nile, S.H., Park, S.W., 2014. Edible berries: Bioactive components and their effect on human health. Nutrition. 30 (2): 134 – 144. Ntijumokwu, S., Kolawole, J.A., 1991. Antimicrobial and Preliminary Phytochemical Screening of the bark of Nauclea latifolia (Family Rubiaceae). West African Journal of Pharmacology and Drug Research. 10: 87-90. Nweze, E.I., Okafor, J.I., Njoku, O., 2004. Antimicrobial activities of methanolic extracts of Trema guineesis (schumm and Thora) and Morinda lucida Benth used in Nigerian Herbal medicinal practice. Journal of Biological Research and Biotechnology. 2 (10): 39 - 46. Obi, V.I., Onuoha, C., 2000. Extraction and Characterization Methods of Plants and Plants Products. In: Biological and Agricultural Techniques. Ogbulie, J. N. and Ojiako, O. J. (eds). Websmedia Publications, Owerri. pp. 271-286. Ogbeche, A.K., Ajayi, G.O., Onyeneta, P., 1997. Antibacterial activities of the leaf extract of Ageration conyzoides. Nigerian Quaterly Journal of Hospital Medicine. 7: 397- 399. Ogbulie, J.N., Ogueke, C.C., Okoli, I.C., Anyanwu, B.N., 2007. Antimicrobial Activities and Toxicological Potentials of Crude Ethanolic extracts of Euphorbia hirta. African Journal of Biotechnology. 6 (13): 1544 – 1548. Ogbuneke, R.U., 2001. Phytochemical investigation of some medical plants of local relevance. Alvan Journal of Science. 1(4): 30 – 34. Ogueke, C.C., Uwaleke, J., Owuamanam, C.I., Okolue, B., 2014. Antimicrobial activities of Alstonia boonei stem bark, a Nigerian traditional medicinal plant. Asian Pacific Journal of Tropical Disease. 4(Suppl 2): S957-S962. Okoli, A.S., Iroegbu, C.U., 2004. Evaluation of extracts of Anthocleista djalonensis, Nauclea latifolia and Uvaria afzalii for activity against bacterial isolates from cases of non-gonococcal urethritis. Journal of Ethnopharmacology. 92 (1): 135- 144. Olukoya, D.K., Idika, N., Odugbemi, T., 1993. Antimicrobial activity of some medicinal plants from Nigeria. Journal of Ethnopharmacology. 39: 69-72. Osadebe, P.O., Ukwueze, S.E., 2004. A comparative study of the phytochemical and antimicrobial properties of the Eastern Nigerian Species of African Mistletoe (Loranthus micranthus) sourced from different Host Trees. Journal of Biological Reaserach and Biotechnology. 2(1): 18-23.Ponce, A., Del Valle, C., Roura, S., 2004. Shelf life of leafy vegetables treated with natural essential oils. J. Food Sci.. 69: 50 - 56.Potterton, D., Shellard, E.J., Press, J.R., 1996. Culpeper’s colour herbal, 2nd edn. Foulsham, London. Prajapati, N.D., Purohit, S.S., Sharma, A.K., Kumar, T., Jodhpur, E., 2003. Handbook of medicinal plants. Agrobios Publishers, Jodhpur, India. Prasad, N.R., Viswanathan, S., Devi, J.R., Nayak, V., Swetha, V.C., Archana, B.R., Parathasarathy, N., Rajkumar, J., 2008. Preliminary phytochemical screening and antimicrobial activity of Samaneasaman. Journal of Medicinal Plants Research. 2(10): 268-270. Rodriguez-vaquero, M.J., Alberto, M.R., Mancade-Nadra, M.C., 2007. Influence of phenolic compounds from wines on the growth of Listeria monocytogenes. Food Control. 48: 587 – 593. Romeo, C.D., Choph, S.E., Buck, G., Garcia, M., Bixby, L., 2005. Antibacterial properties of common Herbal remedies of the south west. Journal of Ethnopharmacology. 99: 253-257. Sahm, D.F., Washington, J.A., 1990. Antibacterial susceptibility test dilution methods. In : Manual of clinical Microbiology. Lennette,EH (edn). 5th edn. American Society of Microbiology, Washington, DC. pp 1105-1118. Seow, Y.X., Yeo, C.R., Chung, H.L., Yuk, H.G., 2014. Plant essential oils as active antimicrobial agents. Critical Reviews in Food Science and Nutrition. 54 (5): 625 – 644. Selim, S., 2011. Antimicrobial activity of essential oils against vancomycin resistant enterococci (VRE) and Escherichia coli 0157:H7 in feta soft cheese and minced beef meat. Brazilian Journal of Microbiology. 42: 187 – 196. Selvamohan, T., Ramadas, V., Shibila Selva, S., Kishore, S., 2012. Antimicrobial activity of selected medicinal plants against some selected human pathogenic bacteria. Advances in Applied Science Research. 3 (5): 3374-3381. Spigno, G., De, F.D.M., 2009. Microwave – assisted extraction of tea phenols: a phenomenological study. Journal of Food Engineering. 93: 210 – 217. Sudhakar, M., Rao, C.H.V., Rao, P.M., Raju, D.B., Venkateswarlu, Y., 2006. Antimicrobial activity of Caesalpinia pulcherrima, Euphorbia hirta and Asystasia gangeticum. Fitoterapia. 77 (5): 378 - 380. Tajkarinmi, M.M., Ibrahim, S.A., Clever, D.O., 2010. Antimicrobial herb and spice compounds in foods. Food control. 21: 1199 - 1218. Tiwari, P., Aishish, K.P., Pandey, A.K., Sahu, P.K., 2011. Antihepatotoxic activity of Euphorbia hirta and by using the combination of Euphorbia hirta and Boerhaara diffusa extracts on some experimental models of liver injury in rats. International Journal of Innovative Pharmaceutical Research. 2 (2): 126- 130. Trease, G.E., Evans, W.C., 1989. A Textbook of Pharmacognosy. 13th edn. Bailliere Tinall Ltd, London. Wang, C.M., Chen, H.T., Wu, Z.Y., Jhan, Y.L., Shyu, C.L., Chou, C.H., 2016. Antibacterial and synergistic activity of pentacyclic triterpenoids Isolated from Alstonia scholaris. Molecules. 21(2). pii: E139. doi: 10.3390 / molecules21020139. Williamson, E.M., 2002. Major herbs of Ayurveda. Churchill livingstone, New York. Xing, Y.G., Li, X.H., Xu, Q.L., Yun, L.A., Lu, Y.Q., 2010. Antifungal activities of cinnamon oil against Rhizopus nigrificans, Aspergillus flavis and Penicillum expansum in vitro and in vivo fruit test. Int. J. Food Sci. Technol. (45) 9: 1837 - 1842.